Come on up, there is room for two! Yesterday I took Evan to a new playground. Taking him to a playground always sounds great to me in theory. I get excited for him to play on the equipment, have opportunities to try walking, climbing, and socializing. Change of scenery for both of us, which is nice. Then I get there, and many times I end up leaving with a knot in my stomach. -Sometimes there are lots of parents and kids. Which is great when you can let your child run and play or at least step back from them a little when they are in the sandbox or small equipment. But I can’t do that. (not yet anyway, I know the day will come). So instead, I follow him around like a hawk, supporting him as he climbs, pushing him on the swing, and trying to keep him from crawling after strollers. -Sometimes those parents do very normal, kind things like ask me how old Evan is when they see him crawling or trying to walk and keeling over. Then I take a moment and say 2. More often than not, the very kind parent will look slightly quizzically at me and at Evan and then say, oh… and smile. Sometimes I follow that up with, “he is a young 2.” But other than that, I don’t really delve into it. But then there is an awkwardness, an unspoken understanding that we both know that he looks a little small for two, and his babbling and lack of walking do not really reflect his age either. Yesterday however, was not one of those days. That may not always happen. Kindness exists, and so does hope. I will continue to believe that more of these moments will happen. A example of my need to keep perspective. I met a friend today at the Please Touch Museum. We have a blossoming friendship that began because we each have a child diagnosed with WS. Her little girl is a beautiful, sweet soul, who smiles immediately when you greet her. Evan has much to learn just from watching her, as she is walking and talking quite well. I love meeting at places like this because there is so much for the kids to enjoy and we do not have to clean up after them. 🙂 However, with Evan being a 21 month old who does not walk yet- this can pose a few problems when little Stride Rites are stomping around at his face level. I made the mistake of bringing the scarf that his physical therapist has been using with him to add him in keeping his own balance while walking. Tried using that for about two minutes before realizing I was frustrating the bejeebus out of Evan. He just wanted to crawl and cruise and do his own thing. “His own thing,” includes checking out each and every stroller wheel he can get his little hands on. And I hate that it is. I try to play it off, saying he loves cars and trucks. He loves to push tractors and trains around the house. That’s the truth, he does. But he also LOVES wheels. Especially stroller wheels. To the point of not wanting to check out all the other super cool things that all the other children playing with. I swallow, and tell myself that it’s cool, he can like wheels, what is the big deal? My dear friend says something reassuring, probably sensing my discomfort. I pull him away from a few different strollers, and I keep placing him at exhibits I think he should be playing with. I feel sweaty from picking him up and moving him away time and time again. Then he starts crawling towards an open door. My friend and her daughter are playing together in the “House” section, with pretend bowls and teddy bears. I notice what Evan sees beyond the open door. 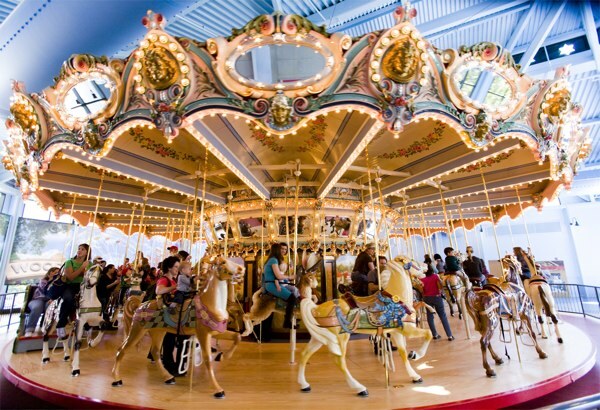 This exact carousel is INSIDE the museum. I pick him up and try to lure him over to these awesome musical exhibits with a rainforest theme. I shake every bell, bang every drum, jump up and down with excitement to keep his interest. I pick him up and he thrashes around like I am taking him to the blood work lab at CHOP. So I ask my friend if it is expensive. She laughs and says it’s only a dollar. So I figure why not, maybe he really does want to take a ride. As we get in line, he continues to thrash about so I put him on the ground and all of a sudden it hits me. It is a BIG, HUGE WHEEL. With fun animals on it. And that was all it took. Putting him down, and watching every part of his face and body light up like the Fourth of July. He hung onto the fencing around the carousel and jumped, laughed, and shrieked with delight. This was not the face of a child who was fixated in an worrisome way. This was the face of a happy little boy. And we rode together on a tiger of some type. Thank goodness for that carousel. For that big ol’ wheel with fun animals on it. Slow your roll, Erin, slow your roll. And let your son roll those wheels sometimes……. Ahhhhh, the holidays have come and gone and another year has begun. Social networking sites and blogs are lighting up with New Years resolutions, recaps from 2012, and pictures form Christmas morning. I try not to make “resolutions” per se, but rather look at the new year as a clean slate of sorts. I know my own bad habits better than anyone, and it is a good excuse to try to start anew and let go of some ugly unnecessary baggage. (in my case,about 30 extra pounds of it) But who’s counting? Todd has begun following the Paleo diet and I am back to weighing my portions, and saying NO to a lot of things that I have been allowing to creep into my diet, such as coffee drinks, desserts, cookies, any thing that has the word chip in it, etc. I also signed up for a 5K in April and started taking piloxing classes. Yep, it’s not a pretty sight, but it is an amazing workout. I think I fell back on food as my comfort a lot this past year, and it is time to get that in check. With the amount of energy our little bug is showing lately, I am going to need to be in better shape to keep up with him. I am hoping to be less tired in 2013 now that Evan is sleeping through the night pretty consistently. We also hope to have more “date nights” even if that means a few hours together at a park while Evan has care, etc. Ok, maybe we do have some resolutions….oh well. Since our Kentucky trip, things have just been going at warp speed around here. We had a playdate with another WS mama and her adorable daughter, Evan participated in his first “Cookie Day,” Christmas festivities for days and days, early intervention 6 month review, and every day he seems to be doing something new and becoming more and more of a toddler. Next blog will be about that…phew! He is continually taking different food risks, and even trying to spoon feed himself. Take cover! I have really started to sign the word ‘more’ with him and do hand over hand to get him to sign it before I give him more solid foods. I can’t put a whole handful on his tray because he will just drop one piece out to put another one in. Just the other day he was eating pieces of french toast sticks and actually SWALLOWING them. Still about 50% pez dispenser expelling action but more swallowing than I have seen thus far. And somehow I managed to not eat more than a tiny crumb to model for him! Win-Win! New items he has tried this month: chocolate chip cookies, meatloaf, couscous, buttered waffles (second time, but this time he loved them), and french toast sticks. It is still amazing to me that he is trying all these foods. I just have to continually remind myself that just because he does not do well with a food the first time, I have to reintroduce it. He is that way with a lot of his toys too, he will not know what to do with it at first, or show no interest. Then one day it will be his favorite toy. My next plan is to look up muffin recipes, and try to find one that is packed with nutrients and calories and try that with E for breakfast. He really likes baked goods and carbs. That’s my boy! Pajamas really are the best. 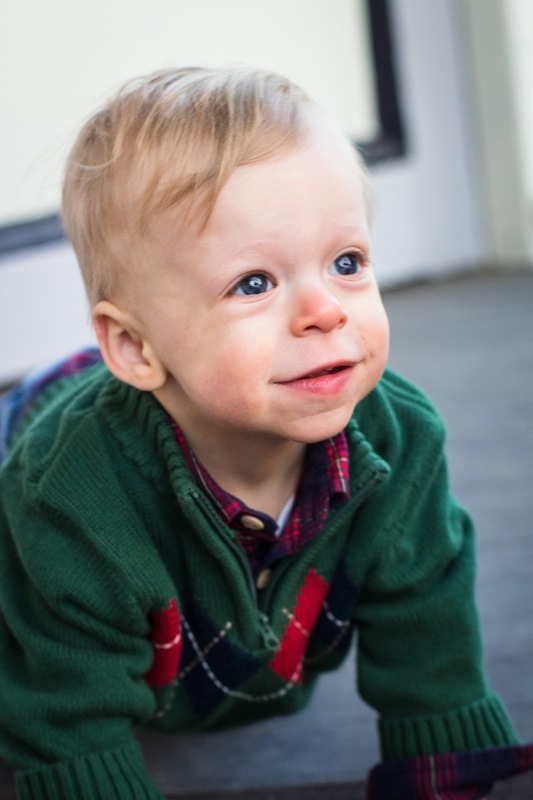 Early Intervention update: Evan is going to start receiving speech weekly, OT 2x a month and PT 2x a month. He just qualified for PT services this past week. We had an assessment based on Dr. Mervis’ suggestion and our OT also thought it would be a good idea. It’s a hard choice, deciding how many hours are enough, but not too much, since we pay hourly.We understand that we need to follow through with the therapists’ suggestions during our time with Evan, and integrate things into his day.